For the first time in over a year, I am actually working on a little crazy quilting. I feel very rusty at it but this is a good project to get on with and finish up. It will be a cushion cover for my daughter - a reminder of her trip back to Brazil last year. This is the project I took with me to work on at the Stampede and that has jump started it for me so I hope to actually finish it. This was the first seam - french knots, herringbone, detached chain stitches. My thought is to keep the stitching primarily in yellow and green - the colours of the Brazil flag. Along with the recycled denim, there are pieces of t-shirts etc incorporated into the piecing. After all this time away from crazy quilting my fingers feel pretty clumsy and I am not seeing the opportunities to add stitching as easily. Like I said, I am rusty. But I am back at it! 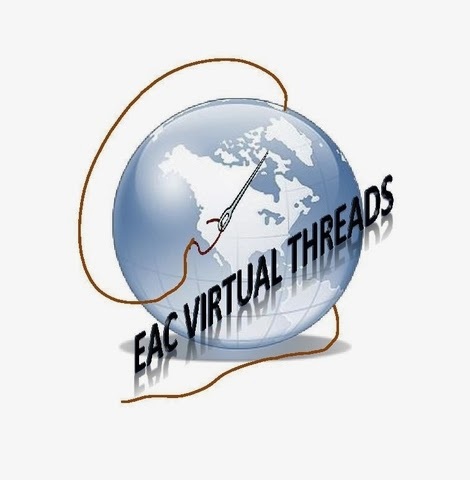 I belong to EAC Virtual Threads, the new online chapter of The Embroiderers' Association of Canada, and one of the activities we have is a Secret Stitcher Exchange. Everyone who was interested signed up to send monthly cards or packages along with something a little special for birthdays and Christmas. The names were switched out and no one knows who has their name but every month they get little surprises in the mail. It has turned out to be great fun! I just received a birthday gift from my Secret Stitcher and just had to share! My two favourite flowers are pansies and sweet peas so this was perfect! Isn't the pincushion sweet!? I mentioned the EAC online auction in a previous post and I managed to snag a couple items in it. The one I am most pleased with is a panel of Peggy Kimble's TAST (Take a Stitch Tuesday) samples! Peggy is a wonderful stitcher. I simply have to share some photos of the piece! I had to take several photos in order to show you the whole thing but this way I can label each section with the TAST stitches Peggy used so that works out all right! The first section above, is labelled on the back Wheat Ear and Crossen Buttonhole. This section covers half chevron and bullion knots. Butterfly Chain, Knotted Cretan, Catchup - used previous stitches. I hope that by clicking on the photos they are large enough for you to see the wonderful stitching on this panel - it is a real inspiration! I finally got a break from gardening and yard work long enough to go down to the grounds of The Calgary Stampede and spend the day stitching with other members of The Calgary Guild of Needle & Fibre Arts. That is me on the far left - as you can see all the time in the sun this summer is bleaching my hair out. Also stitching in this photo is Rhonda. Although most of us don long aprons provided by the Stampede so that we fit the timeframe the Heritage Cabin represents, one of our members (Jenn in the center) made her own costume. It was very authentic and simply gorgeous! I wanted to catch the shape of the dress in the photo and so I called out to her here: "Give me some bustle!" This brought guffaws from the young male tourists coming up the steps to the cabinand a big smile from Jenn! This is a great opportunity to watch the Stampede activities pass by, sit and stitch. We visit with the tourists, many of whom are curious about what we are doing. 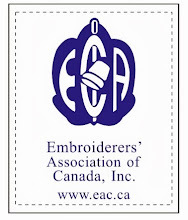 We answer questions about stitching and, of course, manage to promote our chapter to the local attendees. Lots of fun but once my shift was over and I got out onto the grounds, the crowds and heat were a bit much for this country girl! I am happy I got some stitching done though, working on a denim crazy quilt cushion cover for my daughter, designed to remind her of her trip to Brazil last summer.